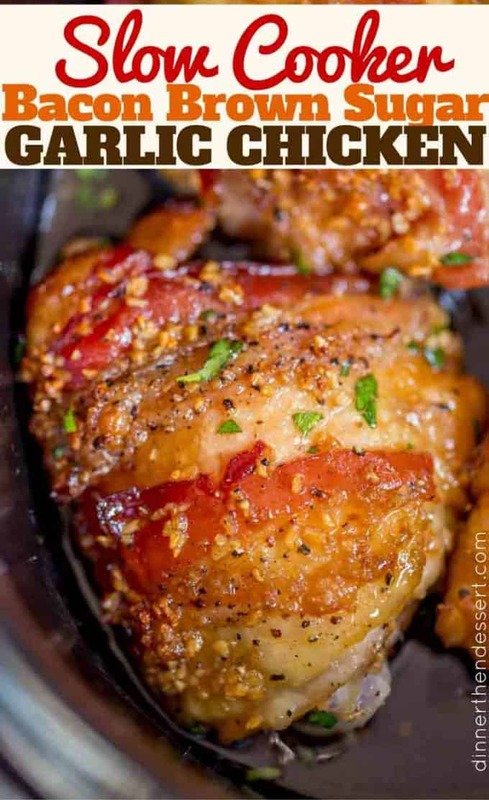 Slow Cooker Bacon Brown Sugar Garlic Chicken is made with just five ingredients in your slow cooker. 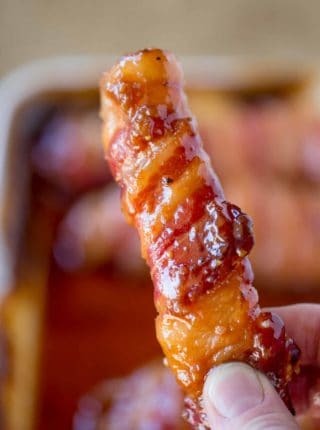 Sticky, garlicky, sweet fall apart bacon and chicken. 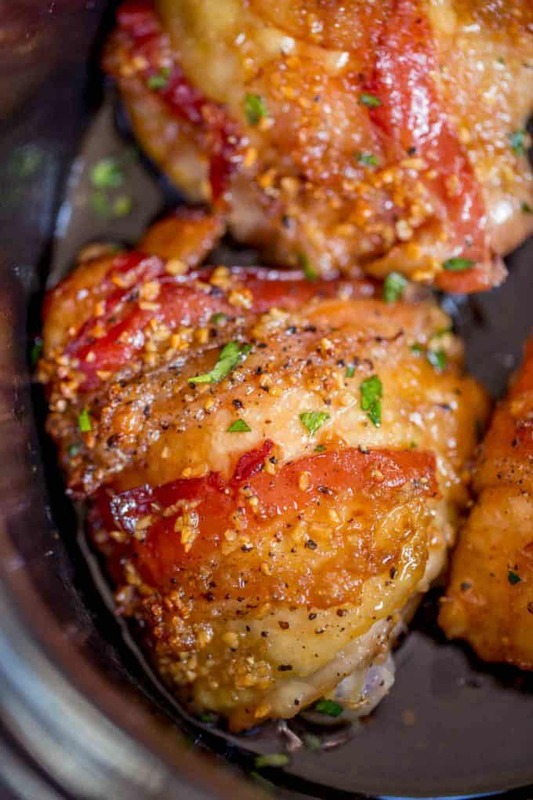 Slow Cooker Bacon Brown Sugar Garlic Chicken is right in line with all the bacon brown sugar goodness on the blog. It is hard to argue with these magic ingredients working well together. Let’s take a ride down memory lane together! Brown Sugar Garlic Pork with Carrots & Potatoes – One of my first recipes and MOST popular to date. 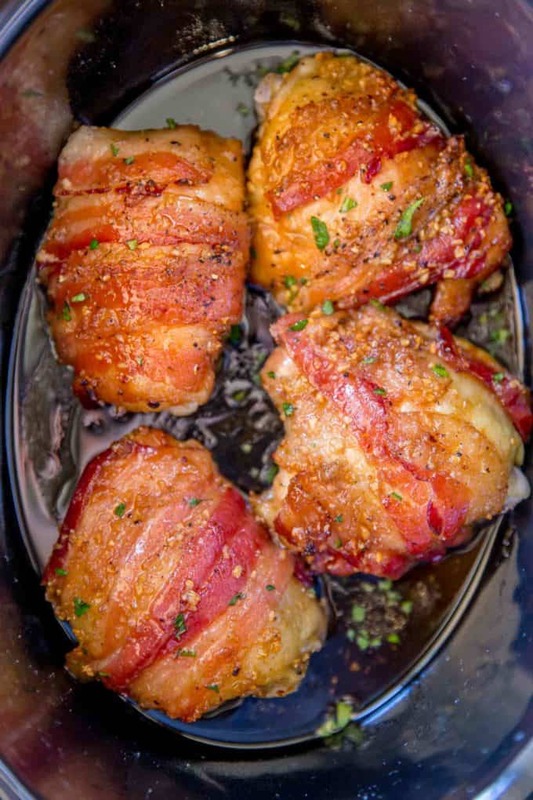 Slow Cooker Bacon Garlic Pork Loin – Hey I should make this in the slow cooker and the bacon can protect the pork loin from drying out. 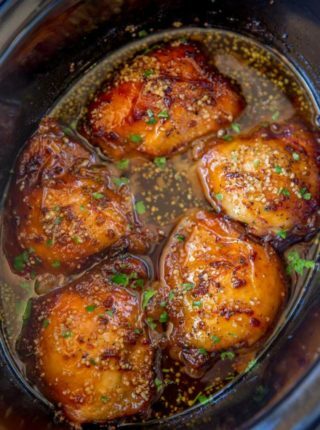 Slow Cooker Brown Sugar Garlic Chicken – Chicken you say? Yes, to all the emails I’d get you can do this with chicken! Brown Sugar Garlic Oven Baked Pork Chops – To all the comments on the original one, you can’t use that method with pork chops so I did this one! 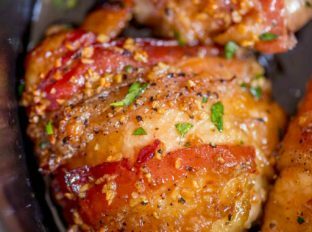 Bacon Brown Sugar Garlic Chicken – To all the questions for the bacon pork loin, yes with chicken! This may shock you because how many ways can this be done? But yes, bacon, chicken, slow cooker goodness. This feels like one of those toys you buy where you can swap out all the clothing pieces individually on the magnet doll. And yes, salmon version coming in the new year along with a whole chicken, chicken wings and more. Look I can’t even say I haven’t enjoyed making and eating all the versions. They are DELICIOUS! Plus they’re so easy its amost funny. I mean this one is six ingredients if you count salt and pepper. I don’t but according to this Facebook video I posted for the chicken tenders people were pretty mad at me for not counting salt and pepper. I called shenanigans and no one thought I was funny, haha. Make it in the oven: Set it on a sheet pan just like you would in the slow cooker and roast at 400 degrees for 30-35 minutes (you may want to use foil). Like things spicy? Add in crushed red pepper or a squirt of Sriracha. Do you like a deeper, more molasses kind of flavor? Try dark brown sugar. Do not add any liquid! I know it can be scary to cook dry in a slow cooker, the chicken will release a lot of liquids. In case you find the chicken is not as caramelized in your slow cooker as the photos it could be your slow cooker runs a little cooler than mine. In that case put the chicken on a sheet pan and cook under a broiler for 45-90 seconds while watching it like a hawk to and removing before your garlic starts burning. You could really serve this with just about anything your family enjoys. We usually serve it with rice and some type of vegetable. I hope you enjoy it! My husband and I have a small poultry farm. I used two fresh leg quarters in this recipe and baked it in the oven. It was delicious! I will try the slow cooker next time. I served this with brown rice and a wedge salad and it made a good meal that I would definitely serve when we had guests. This looks easy and delicious. Can you put more than 5 pieces in the crockpot? Do they have to be against the floor of the pot? You really don’t want to overcrowd the slow cooker otherwise it won’t get a crisp on it. Omg!! This was so simple and easy to make…the directions were simple and it came out perfect and delicious!!! Is that parsley sprinkled atop of the finished recipe ? I don’t know what I did wrong. Maybe the pieces were too small? I used five thighs, as instructed but not even at six hours on low, it is burnt. I bought five, skinless thighs. It was just a little over a pound. I’m so bummed. This is my second try with the new crock pot. Maybe the pot is too big? Oh no! That’s a bummer. What size is your slow cooker? Not yet but going to. 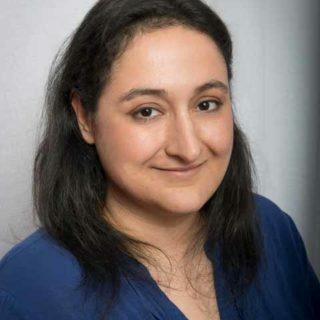 I am by myself now as hubby passed away in May/2018. I always buy chicken and pork and sometimes fish. I can also cook beef now whereas when hubby was alive I gave up beef for over twenty years. I will not cook a lot of beef but will have it once in awhile. I have been glancing thru your recipes and I see many I want to try. Thanks for all your hard work putting them together for all us foodies. I have to shop tomorrow so will see what I have to add to my cupboard. Nothing I hate worse when you want to try out a new recipe and your out of some of the ingredients and have to run out to store. Thanks again you will be hearing from me. Can I use boneless breasts instead? Thighs tend to stay juicer in the slow cooker so that’s why I usually recommend them. If you know it might be a bit drier, go ahead and use them. The bacon will help keep them more moist than usual. 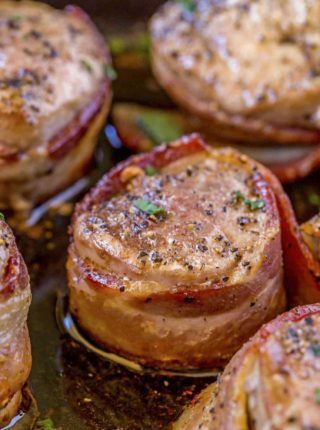 Can I use chicken breast with Turkey bacon in slow cooker?? We dont eat pork. Really want to try this! Thanks! I don’t think the turkey bacon will work. It’s the fat from the bacon that keeps the chicken moist. If you decide to try, I’d love to know how it turns out. Thanks! This recipe was super easy and delicious! I used skinless boneless chicken thighs and baked it at 400 degrees for 30 minutes as instructed in your notes. Came out perfect! My family loved it! Thank you for sharing all these simple but tasty recipes! You’re welcome, Alice! So glad you all enjoyed it! Made this for dinner tonight and it was fabulous! The chicken was so moist and the bacon gives it a delicious smoked flavor. Broiling it for 2 minutes really gives it a nice crispness…worth the extra time. Thanks for sharing! 2 tablespoons of minced garlic, or 2 teaspoons? I am afraid to overgarlic the chicken! I switched over to this recipe on your suggestion since I’m using chicken breasts. I plan to wrap each breast in bacon, but am worried about the amount of garlic. Help! The thighs were nice and juicy but honestly didn’t have much in terms of flavor. I had one thigh tonight but unfortunately I’m not looking over to my left overs like most crockpot recipes. I read after the fact, you wouldn’t recommend boneless chicken breast, but I had already started cooking the boneless chicken breast in the crockpot…it still turned out really good! My boyfriend said the chicken was so good and tender, he asked if we could cook chicken like that all the time, haha. I did the same thing just now. I prepared it all, turned on the slow-cooker and then came to read the comments. I had 2 really big, juicy boneless breasts that I lightly seasoned with garlic salt, onion powder and black pepper. Then wrapped them with one strip of bacon each. In to the pot with light pepper flakes, the salt, more pepper, then the sugar on top. I’ll take a picture and let all those like us see how that would look and taste. Alot of your recipes have Kosher salt where I’m from Australia, melbourne. I don’t believe this will b easy enough to find ? Or I have a feeling it will b super expensive ? Is there something I could use instead ? Would normal salt do ? Please what should I use. I prefer Kosher salt because it’s much easier to pick up between my fingers and thus gives me tighter control over seasoning. I also like that it doesn’t have some of the additives that table salt includes. If you’re unable to find it, go ahead and substitute for table salt. so this looks delicious and I’m getting ready to put it in the Crock-Pot, do you think that fresh green beans in with the chicken would work and taste good and when would I put them in? I would recommend making them separately. Would Turkey Bacon work in this recipe? Can the chicken thighs be replaced with chicken breasts? Because bacon will help to keep the breasts moist, I think it should be fine. I prefer thighs because of the deeper flavor. Will this recipe work with skinless chicken thighs? Have to stop at the store on my way home tonight..going to put this all in the slow cooker in the am and dinner is done! What about doing this in an insta-pot? 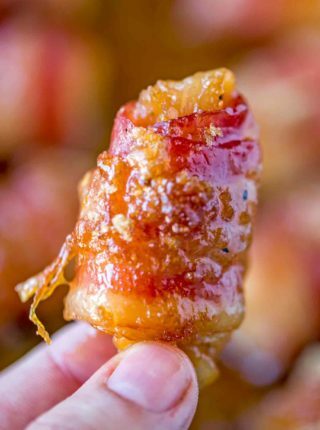 And I adore how your use of wrapping things in bacon… one can never have to much butter or bacon! I haven’t tested it using an IP so I’m not comfortable giving a recommendation. You might be able to find a recipe online using one that has similar ingredients and follow that. BTW, totally agree about the butter and bacon! Mmmmm! WIll chicken breast work? Bone in with skin of course. I’m making this tonight with yams/sweet potatoes. Also, I use Tony Chachere’s & brown sugar on salmon to get that heat with the sweet. Came out so good, bacon was crispy! Thnaks! You’re welcome! Thanks for the 5 stars!! This didn’t really work as I expected. The sauce was very thin and not sticky at all, I used thighs instead of breasts but still cooked for the same time. The family said it was too sweet and a bit weird! I’ll try again and add some chilli and thicken the sauce with cornflour before serving. Has anyone ever made this in the crock pot using boneless skinless chicken instead? I usually don’t recommend boneless skinless chicken in a slow cooker because it can tend to dry out. If you’re ok knowing that going in, you can definitely give it a try. I’ve done this recipe using boneless skinless chicken breast. Only adjustment I would make to do this method is to add butter with it in the crockpot- it doesn’t dry out. Also, with the butter and the juices from the chicken, you can make a pretty tasty gravy. All you need besides that is flour and a little bit of water! Did this and it was a big hit! I generally tend to use frozen chicken for almost all of my crockpot recipes. Do you use thawed or frozen thighs? Or does it matter. I use thawed as I find that frozen releases too much liquid while in the slow cooker during the cooking process. I made this in the crockpot and would not recommend that method to cook the chicken. Put it in for the recommended 8-9 hours on low and it was WAY TOO LONG! Chicken was very dry. Flavors were good and would recommend the cooking of the chicken in the oven so you can check the temperature of the chicken as it gets to the end of the cooking time. Also, the bacon did not crisp up in the crock pot so I ended up putting it under the broiler for about a minute. I’m so sorry the timing didn’t work out for you. I can assure you that this recipe has been tested over and over with no issues. The only thing I can think of is that maybe your slow cooker runs a bit hotter. I hope you decide to try it again and just adjust the time for your slow cooker. Doing it for 5-6 hours as forgot to put it in for the 6-8 on Warm! Hopefully turns out ok! How’d it turn out, Amy? It’s snowing with freezing rain mixed in … perfect day for a crock pot meal, so I’m trying this One! I’ll let you know how it turns out. I hope you enjoyed it! That kind of weather is perfect for the slow cooker! Snuggle up in a blanket and let it do the work! Gosh , this looks so good! Can’t wait to try it out. I know that you have said several times…… just put it all in the crock pot. But it looks like you have browned the tops of the thighs with the bacon prior to the cooking in the crock pot ? Nope, I didn’t for this recipe. Sometimes I definitely do brown chicken before hand but these went in completely raw. You can of course brown them at the end of the meal if you find they aren’t as pretty at the end of the cooking time (some slow cookers keep in moisture more than others, run hotter/colder than others, etc) you can pop them onto a cookie sheet for 5 minutes in a 400 degree oven. I have the pork loin version in the slow cooker too and some people need the oven to crisp it while others say it looks just like the picture when they open the slow cooker. I find more people tend to have better success when using the aluminum insert slow cookers like the one linked above or the one All-Clad sells that I have as well. But regardless of which one you use, finishing in the oven if you find it hasn’t browned as you’d like is a pretty quick task. Hope the recipe turns out well for you! Silly question but do you cook the bacon first or no? Nope! Put it on the chicken raw. I assume these are bone-in thighs? Do you think boneless-skinless would work as well? Looks delish! I usually don’t recommend boneless-skinless chicken in the slow cooker because it tends to dry out a bit. The bacon will help but the fat from the skin is really what keeps it moist. If you know that might happen going in, you could definitely try it and let us know or even use a boneless skin-on thigh instead. This chicken is going to be a huge hit here! Looks so delicious! I love your flavors and I love that the slow cooker does the work! I love this flavor combo, and it looks delicious! Looks so tasty! Perfect for a Sunday gathering! Love that this can be made in the slow cooker, and as easily in the oven! The flavors sound amazing, and it looks beautiful! Thanks, Patricia! I couldn’t live without my slow cookers!! Oh my goodness, that is making my mouth water! You could really serve this with just about anything and have a delicious meal! I would recommend my Ultimate Slow Cooker Mashed Potatoes https://dinnerthendessert.com/slow-cooker-mashed-potatoes/ though. Super easy to make and are a great accompaniment to the chicken. Enjoy!